Mike Yarish/Warner Bros. Entertainment Inc.
“Wait, should it be, ‘Dear cast and crew,’ then?” asked one student. “Yeah, that’s what I write,” his seatmate chimed in. They were on a bus of UCLA students buzzing with excitement after a return visit to the set of the hit TV show, “The Big Bang Theory,” all settling in to write thank-you notes to the more than 80 people associated with the hit sitcom who fund UCLA’s Big Bang Theory Scholarship Endowment. Many of them noted that without the scholarship, they would instead owe thousands of dollars in student loans, and at least one student would not have been able to attend UCLA at all without the scholarship. They are among the 35 students who have received scholarships from the endowment. When created in 2015, 20 UCLA students pursuing degrees in science, technology, engineering or mathematics were selected. In each subsequent year, five additional low-income UCLA students who are pursuing degrees in the STEM fields — which are the fields pursued by the characters in the show — were chosen. That grew on Thursday with an announcement by Chuck Lorre, the show’s executive producer and co-creator. “In honor of our 12th and final season, we’re going to double our students, and we’ll be doing 10 every year instead of five,” Lorre told the students, UCLA officials and cast and crew. The scholarship will support one extra student each year until it reaches a total of 10. Lorre noted that although the show was ending, the scholarship would continue in perpetuity. “After the sun has burned out and this is a cold, lonely rock, we will still be giving,” Lorre joked, switching rapidly between sincerity and humor as he congratulated the first group of Big Bang scholars on their graduation this spring. “We’re proud of you. We had a little bit to do with it, which is really nice. And we hope that you take whatever it is you got out there and you have to go and do something with it, or we will hunt you down. We know your names,” he said as the students laughed. He added that thanks to the $5.5 million raised by the show, the endowment will also support Big Bang scholars who pursue a University of California graduate degree, like Quincy Zlotnick and Christopher Chen, who both expect to attend UCLA next year for graduate school. Big Bang scholars will be eligible for up to $15,000 annually for four years of grad school at UCLA or a one-time grant of up to $15,000 at other UC campuses. 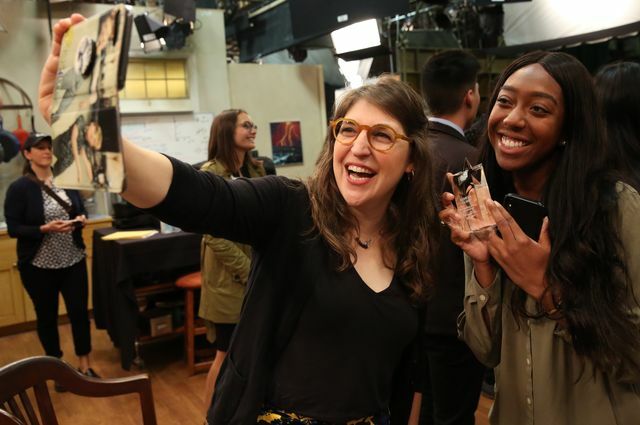 Mayim Bialik, who plays Amy on the show and graduated from UCLA with a doctorate in neuroscience, told the students how proud she was of them all before leading them in a final 8-clap. “And Thirsty Thursdays,” interrupted actor Kunal Nayyar. The scholarship has done exactly that for first-year student Tamar Ervin, who is majoring in astrophysics. She had planned to take out loans and bridge the rest of the gap by working during the school year, and expressed gratitude at being able to focus on her classes instead. 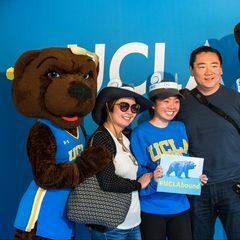 Likewise, junior biology major and first-generation college student Jonathan Shi noted that when he was deciding to come to UCLA, his mother encouraged him to go, but he knew that she was stressed about how to pay. The scholarship made a huge difference for his family, he said. Junior aerospace engineering student Mia Reyes would not have been able to attend UCLA at all. Two days before the deadline to commit to UCLA — her “dream school” — she reluctantly selected a more affordable alternative, then at the last minute learned she had received the Big Bang scholarship that changed her life. Now, she’s part of a group called Bruin Space creating a high-altitude research balloon, and works in the engineering school’s Makerspace. At UCLA, more than 50 percent of all undergraduate students receive need-based scholarships, grants or other aid. That includes approximately 35 percent of undergraduates who receive Pell Grants, federal aid for students from low-income families. More than a third of UCLA undergraduates are first-generation college students. Since 2015, the Big Bang scholars have visited the show’s set at Warner Bros. studio in Burbank at least once a year, and the actors, crew and others have come to recognize them. Each incoming class has received iPads, and at Thursday’s reception, representatives from Dell Technologies, who provide computers for use on-screen by the show’s characters, provided laptops to all the graduating seniors. The students also have an on-campus club, and the show supports the club’s events, from study nights and beach clean-ups, to tours of SpaceX and Northrop Grumman. Thursday found Bialik deep in conversation with seniors Kemeka Corry and Mekai Ruddock, both of whom she has now known for four years. 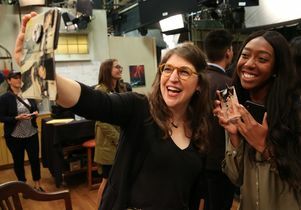 “Mayim comes to see us at UCLA, and I don’t even know how many times we’ve come back to the set,” said Corry, a psychobiology major planning to attend medical school after a gap year. The people from the show really treat them like family, she said. The show created an endowment unlike any other at UCLA, said Rhea Turteltaub, vice chancellor for external affairs, as she reminisced about the formation of the scholarship. The endowment was originally created via a founding donation by the Chuck Lorre Family Foundation, combined with gifts from more than 50 people associated with the series — including the show’s stars, executive producers, writers and crew — plus partners such as Warner Bros. Television, CBS, ICM Partners, United Talent Agency, UCLA physics professor David Saltzberg, the show’s science consultant since its inception, and more. The actors expressed their own amazement that they could be involved in the students’ lives. Johnny Galecki, who plays Leonard, described the show as a dream come true that checked off almost every box on his list.